Condo Issues.com: Negligent Condo Conversion? The Conversion Cycle. The latest round of conversions of old apartment buildings to condominiums has come and gone. While the cycle was quick, no professional in the community association industry could have missed it. Numerous "new" communities were created from old apartment buildings during the five years of the late, great, housing boom. Why then? Because when not only is every piece of residential real estate selling as fast as it's listed, but when there is also a waiting list to buy new homes, you had to know that developers would start looking for something else to sell — perhaps something that didn't take several years to develop and build. Immediate inventory, if you will. Old apartment buildings are made to order. Add to that the fact that in such a super-heated market the value of an apartment is much greater if it can be sold as an individual parcel than if it is just one unit in a large rental complex, and you have the makings of another conversion boom. I say "another conversion boom" because we have seen one twice before — in the early eighties and early nineties — and each time, at the tail end of an upswing in housing prices, numerous apartment complexes were converted to condominiums. The latest version just ended, and we probably will not see any further conversions for a long time. In less superheated real estate markets, buyers prefer new construction and will pay to get it until prices reach record levels and/or there is no new inventory to buy. When that happens, the housing market will temporarily support conversion activity again. Conversions Are Not New buildings. Conversions are not new construction — far from it. Many apartments converted to condominiums are 20 to 30 years old at the time of the conversion. Some are well-built and well maintained, but many are not. For those that bring with them to the market extensive deferred maintenance, the developer must provide either the cash or a funding plan to offset the cost of necessary repairs. The California Department of Real Estate (DRE) issues regulations that govern the sale of all residential real estate, including conversions. 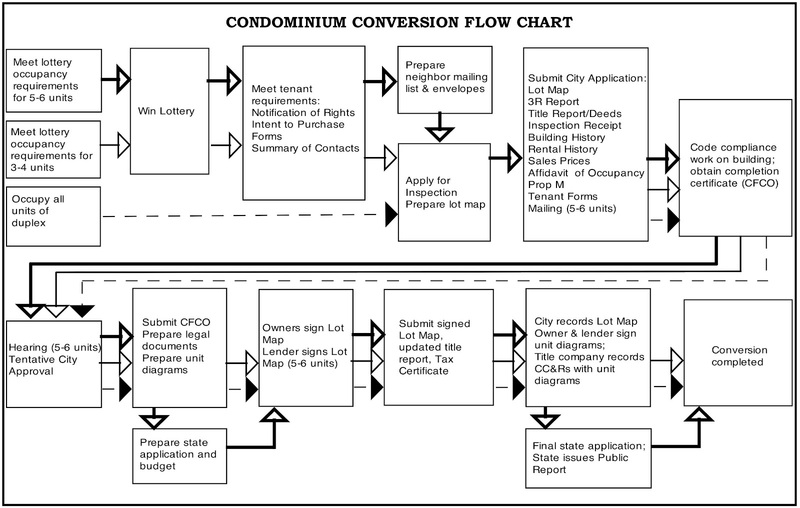 Since most conversions become condominiums, the DRE rules (and state statutes) regarding funding condominiums apply, and the rules require that (1) the project be self-sufficient, and (2) the prospective buyers be informed of the maintenance and repair costs that they will be expected to pay with their monthly assessments. Without a funding plan that allows for self-sufficiency (owner assessments are the only recognized source of income for condominium associations--they do not share in city revenues) the community cannot survive. The assessments are levied on the authority of the governing documents which are also created by the developer of this new community. State statutes and DRE regulations require that all prospective buyers be provided with disclosures detailing the true financial condition of the project. Assembling a Community. So what we have is a collection of parts for this new condominium community — the buildings, yes, but also the funding plan, the required disclosures, and the governing documents and they all must function in harmony for the project to survive as advertised. If the condition of the buildings is not offset by sufficient funds for repair, the owners will receive a flawed project, one that is not self-sufficient on the strength of the budget (and the monthly assessments) provided. These flaws are commonly the result of mistakes (we'll leave the question of intentional errors for another day) committed by the developer in putting the project together. "Negligent conversion" is another way of saying that mistakes were made when joining all of the required pieces together. The developer basically has three choices under the existing law in California: (1) Rehabilitate the buildings so that they are in a "like new" condition. (2) Provide cash to the association to offset any deferred repairs, or (3) Set the assessments high enough so that the association will collect enough working capital in time to perform needed repairs. While some combination of these three will work, the converter cannot choose to do “none of the above” as in, do only a few repairs, underfund the budget for what is left to do, and keep assessments artificially low. Conversion Claims. It is tempting to view condominium conversion claims as "construction defect" litigation because they typically involve infrastructure repair issues. But in the usual conversion case the repairs are those that either the developer did badly or failed to do at all. Original construction defects in the usual sense of that term don't apply unless the developer did a substantial renovation or the project is less than ten years old. Like a new construction claim, the damages in a conversion case are calculated as the cost of performing necessary repairs, but the "defects" are more often the ravages of time which were left unaddressed than original construction errors. Nevertheless the legal theory of Negligence pervades both types of claim. 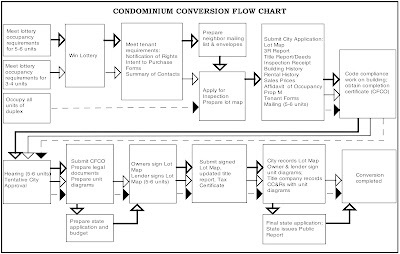 In the case of conversions, however, the failed "product" and the "work" of the developer is not just the physical building itself, but rather the entire assembly of buildings, financial plan, governing documents, disclosures, and government approvals which together are necessary before any separate interest in the development can be sold. Sellers of condominium conversions seem to have the idea that since these are "used" buildings, what they are selling is "as is" and without warranty, and may even put such disclaimers in sales contracts. But nothing could be further from the truth. In the first place, those disclaimers in sales agreements do not bind the association since it is not a party to the agreement, and it is the entity which the developer has obligated to maintain the project. But for the reasons stated above, there can be no such thing as an "as is" sale of an apartment conversion — at least one that attempts to be a legal condominium. The conversion budget either meets the state requirements or it doesn't. State law requires that the condition of the buildings and the funds available for maintenance be in balance. The physical buildings may be left “as is” but the other vital parts of the project — funding plan, disclosures, documents, and approvals — must provide sufficient resources to the association to permit it to deal with any "as is" conditions of the buildings. The buildings cannot be sold as a common interest development without the other parts of the project properly prepared and in place. The Converter's Liability. For these reasons, the negligence of a converter can actually be broader than that of a builder of new condominiums. As much as he is selling condominiums, he is also selling the funding plan necessary to make the project work. Condominiums are not like single family homes — the law requires a certain level of funding to deal with long term repairs and replacements — hence the budget required by the DRE. And converted condominiums are not like newly constructed ones. The financial plan and disclosures necessary for new construction are not as critical as those for conversions since the owners will not be immediately affected by any underfunding of the financial plan — at least that part of it intended to deal with long-term repairs. With twenty-year old apartment buildings, however, many repairs are no longer “long-term” and there is little time left to make up for underfunding if substantial repairs are left for the new owners. Litigation over conversions usually does not involve original construction issues against the builder — too much time has passed. But those problems and the more prevalent problems of a deteriorated infrastructure with no resources to deal with it, are the basis for most claims against condominium converters. Negligent Conversion. To summarize, a condominium conversion claim is usually not brought for construction defects per se, at least not as those claims are commonly understood. The typical claim for negligence in condominium conversion is for the failure of the converter to properly assemble all of the necessary component parts in a fashion that will allow the new association to function as it was intended and as the law requires — to have sufficient funding on hand to deal with all of its maintenance and repair responsibilities as well as its day to day operating expenses. The failure to do this we call negligent conversion, and the damages properly assessable is the amount of cash necessary to properly fund the new entity, given its condition. The converter can legally decide to do minimal work to the building, but the funding plan must correspond to a building in that condition. And with a conversion, it is not enough to simply comply with the statutory requirements that the budget be based on an inspection of just "visual and accessible" components. Many of the deferred (and expensive) repairs will be found in areas that are not observable with just a superficial inspection, and although the California Civil Code discusses that, it also requires that the repair of all components with a service life of less than 30 years be included in the budget — and it does not limit the manner of inquiry necessary to determine that. From this we conclude that the "visual and accessible" inspection standard is a minimum only, and when necessary, more intrusive inspections must be undertaken to determine the service life of all components. When that's done, most conversions will fail the test because it is often the case that the budget provided by the converter, and the level of assessments upon which it is based, will not compensate for the condition of the buildings, when their condition is properly inspected and cataloged.